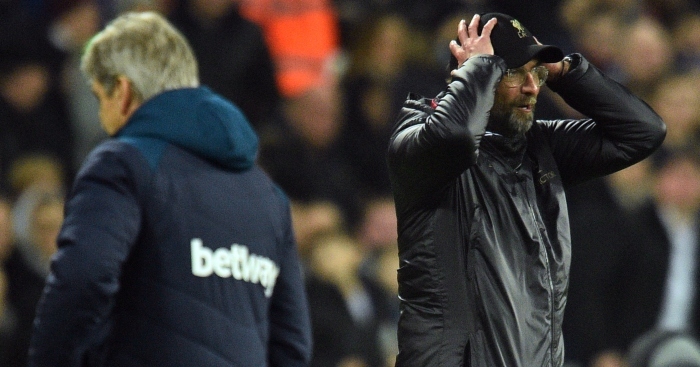 Liverpool fans are beginning to worry about their current form in the Premier League title race – but is their concern necessary? The Reds remain top of the table but are now just three points ahead of Manchester City with 13 games remaining. We’ve taken a look back at the last five title winners to see when, and the what extent, their form as tailed off during their successful campaigns. Well, erm, we don’t want to worry Liverpool supporters, but last year’s title winners, and the Reds’ main contenders for top spot this season, didn’t really have a blip. Revisiting City’s results really puts into context the ridiculous standard they set under Pep Guardiola. Eighteen consecutive victories came before something even resembling a blemish occurred: six matches, three wins, two draws and a 4-3 defeat to Liverpool. Liverpool can at least draw hope from the fact it does not appear to be quite such an intimidating City side this time around, with the reigning champions having lost three times in four matches in December, while they were also recently beaten by Newcastle United. Antonio Conte’s Chelsea got their blip out of the way nice and early, going on a run of a draw and two defeats in September which prompted the Italian’s switch to a 3-4-3 formation. Those three results were followed by a run of 13 successive wins, and while they would drop points five times over the second half of the season, by that point the title was more or less wrapped up. F*cking hell. Leicester won the league, didn’t they? This will never not be absolutely brilliant. Despite finishing 10 points above Arsenal, the Foxes could actually afford a couple of rough spells as they started with just four wins from their opening nine matches, albeit with only one defeat coming in that sequence. And they also suffered around the turn of the year, winning just once in five games, although again that contained just a solitary loss. While they dropped points 15 times across the whole season, Claudio Ranieri’s men were rewarded for only being beaten on three occasions. Like many of Jose Mourinho’s previous title winners, Chelsea were ominously consistent and only twice dropped points in consecutive games. The first came during the festive period as the Blues drew 1-1 at Southampton before losing 5-3 at Tottenham. And their second dip in form came when the title had already been secured, drawing 1-1 with Liverpool and losing 3-0 at West Brom. Liverpool fans will still be scarred from this campaign, when their dramatic collapse™ – a defeat and a draw, it was hardly Keegan’s Newcastle – allowed City to steal the title from underneath their noses. Both sides were inconsistent over the first half of the campaign, with City dropping points six times and Liverpool eight. But the only occasions City dropped points in consecutive games actually came after the turn of the year, as they lost at home to Chelsea before drawing at Norwich in February and lost at Liverpool and drew with Sunderland in April. While Liverpool won 11 games in a row between February and April, City themselves put together eight, four and five-match winning sequences. It should be pointed out that Liverpool’s current ‘blip’ is possibly being over-exaggerated due to the stunning form City produced last season. At the time of writing, they have drawn two consecutive games, meaning they have won two, drawn two and lost one of their past five games. Everything depends on their response.